Unfortunately, things seem to be getting progressively worse and I’ve been confined to staying at home. When I do go out, it’s to the doctor’s office, hospital, physiotherapist, or for massage therapy, so I usually try to take advantage of the fact that I’m already out of the house and grab something to eat… But apart from that, I don’t get to see or talk to anyone during the week other than Michelle and my only connection to the "outside world" is via Twitter. Not very exciting. So two weeks ago, when there was a lot of commotion in our neighbourhood – sirens going off like crazy and fire trucks blazing down our street – it was the most excitement I’d experienced in a long time. it’s not too often that I get to use my camera to take photos anymore and having something happen so close to home was a rare opportunity. Luckily, I was having a relatively good day and I had enough energy to trek down the street to see what was going on. I’ve never seen so many fire trucks in my life – there were fire trucks and police cars at every intersection for about a three block radius from the location of the fire. They were obviously preparing for something huge and it was quite the sight to see. 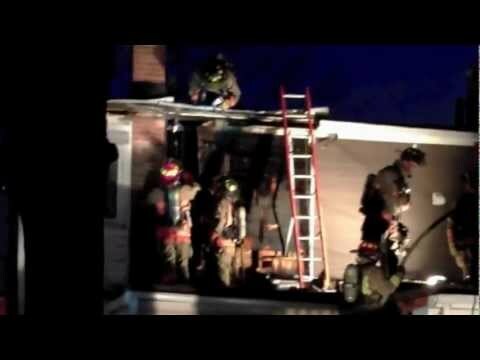 […] The fire began outside and spread to the interior walls of the home just before 6 p.m. Crews had to remove parts of the roof to fight the flames. My neighbour’s house caught fire tonight. Lots of firemen and trucks all over the place. The fault appears to lie with a roofing company who had left 30 minutes prior to the house fire breaking out. The neighbour on the other side of the backyard spotted the flames/smoke while BBQing and called 911. BBQing the first week of January ? Yup. Temperatures were above seasonal and you can see from the photos (and video) that there was still no snow in Toronto. By the time I got in front of that house there wasn’t much left to see, but I ended up having to stay in front of it for a while. It was cold and I wanted to head back home but I was way too tired to walk back so I had to sit down and wait a while in hopes that I’d regain some energy… Oops! 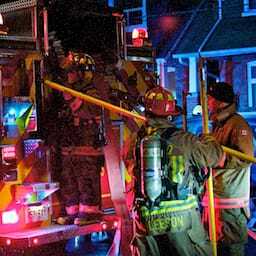 House Fire in East York was published on Wednesday, January 18, 2012 at 2:30pm EST by Daniel Menjívar and last updated on April 11, 2018 at 9:30pm UTC .